King Nicholas Rostov vows to protect his beloved country from both Napoleon's troops and the Brotherhood, a band of terrorists threatening his borders. When the mysterious slave, Sera, saves him from an assassination attempt, Nicholas brings her home with him, ostensibly to protect her. <br /><br />Little does Nicholas know that Sera is a princess in disguise. 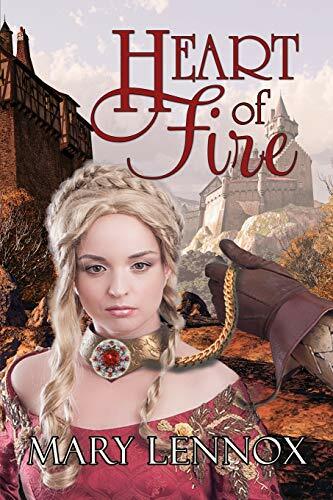 On the run from Anatole Galerien, who is determined to kill her, she is on a desperate quest to retrieve the stolen Heart of Fire, the magnificent ruby that hides her magical kingdom from the outside world. Now, a pampered prisoner in Nicholas's castle, Sera feels her magical powers growing at an alarming rate. Without her grandfather's help, she must learn to understand and control them before she shakes the very foundations of Nicholas's castle. <br /><br />In this frightening land of strangers, war looms and danger lurks everywhere. As Sera struggles to keep her secrets, find the ruby, and master the magic inside her, she instinctively turns to the compelling captor who overwhelms her with his strength and confounds her with his comfort.<br /><br />But what good can come from loving an outlander when her very survival depends upon her fleeing this brutal world and returning home?<br /><br /> Mary Lennox grew up dreaming of places where magic and happy endings co-existed. She woke up long enough to leave graduate school, marry an irreverent lawyer, and tour the world. Nothing could have prepared her for the medieval beauty of Europe's cathedrals, the grimness and glory of Russia, the exotic mysteries of India. Now back to dreaming full time, Mary spends her days creating worlds where magic and human endeavor vanquish evil and a happy ending is guaranteed.